Title: EASTER EGGS: a sketch of a good old custom. Description: Ipswich, Cowell's steam Printing works 1870) Frontis. 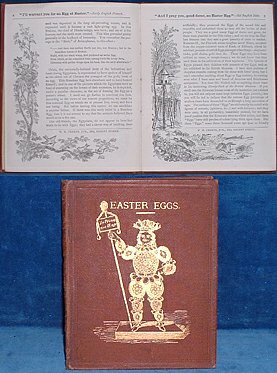 of a figure made up of decorated eggs (repeated on last page) + text illustrations on each page repeated 4 times throughout the book . 16mo brown gilt pictorial cloth using the frontis in gilt as the pictorial element (tips rubbed) 16pp *RARE British Library has this book only as a microfilm from Bodleian Library copy.